Nothing to write home about, but I did manage to get the numbered tacks in my upstairs storm windows today. Of course, this will make figuring out which window each storm belongs in a lot easier next fall. Now I can put them in storage. It's full on geraniums this year in the front yard. My new wood frame screens are now installed. I'm getting good at taking measurements for these windows. Once I figured out which screen fit in which window, they slid right into place. Even the one I had cut out-of-square. I now have full breeze top to bottom. I looked through all of my old photos for a picture of these same windows with the old aluminum storms with the top glass and the bottom screen. But, evidently this is the one part of my house that hasn't been photoed in different stages of "done" one thousand times. Or even once, for that matter. I just picked up this newly framed print. It will hang in one of my guest bedrooms. I saw this print many years ago in a catalog. Of course, I lost the catalog and never saw the print again. One day when I had too much time on my hands I decided to do an internet search. Lo and behold I was able to track down The Doll School by Walter Osborne to the National Gallery of Ireland. And as luck would have it they sold copies of the print....and would mail to the U.S. My print arrived under a week after I placed my order online. Welcome to the Third Annual Bungalow Blog Tour! There are ten bungalow (or bungalow in spirit) blogs participating this year. At the bottom of each Tour post, you will find a link to the next house and one back to the previous house. If you follow the complete tour, you should end up where you started. The most searched topic on my blog is "kitchen." The question I hear most often from blog readers, family and friends alike is "How is the Kitchen coming?" So, I thought it was only logical that my post for this year's Bungalow Blog Tour would be concerning my kitchen progress. The work on my kitchen had taken a long time. A really long time. Forever, actually. Last year I finished work on the ceiling & lights. I then needed a long break to clear my mind. So here and now I am going to make a list, complete with photos, of what I hope to accomplish this summer. You are allowed to pester me throughout the summer if you feel I am slacking off on my list. 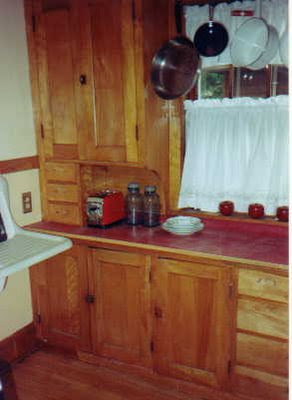 First, I have a vintage red linoleum counter top. It is very cool, but it has also seen it's better days. When I first moved into my house, I scoured the linoleum and then treated it with butcher block oil. It looked great. However, there are areas that no amount of scrubbing can fix. Then one day my mom replaced the flooring in her kitchen and chose linoleum. She had a cute sizzle strip cut into the sheet of linoleum to run around the edge of the room. It got me thinking. I ordered samples and lo and behold they had a color that matched my current counter top identically. Then I started thinking a little more. How cute would it be to have the same design of my wallpaper cut into the corners of the counter top in pale green? Look for this later this summer. Next, is the project that will make the most difference to the look of the kitchen. Getting the wallpaper up. I have had this wallpaper in storage for 6+ years. After much consideration, I have decided to hire a pro to hang the wallpaper. This is *so* unlike me. But, this wallpaper was expensive. Really expensive. I'm also not entirely sure they make it any more. It was shipped from England. That, and my walls are uneven plaster.....and there are both inside and outside corners that will need to be matched. This is beyond my skill level. I have the name of a recommended pro (thanks, Hirshfields). There is one big decision standing between me and a newly wallpapered kitchen. Do I strip the many, many layers of old paint off of the plaster first? There are half a dozen layers of thick paint. There are also some sections that have more layers than others because of some unfortunate cabinets that were put up sometime during the 70s. I desperately do not want to strip more paint. But. This nags at me. Will I pay to have my lovely wallpaper put up....only to be able to spot lines underneath.....or worse yet, bubbles? If I end up stripping the top part of the wall, I will have effectively stripped every surface in the entire kitchen, with the exception of the sink. Oy. Thirdly, I am nearing the end of stripping the scored plaster below the chair rail. Regular readers have been treated to a mind numbing number of posts on this topic. I apologize. The Great Scored Plaster Stripping Nightmare is almost over. I had a vintage red shade of paint chosen for the lower half of the wall. But, last summer I started waffling. Too much red, I kept thinking. I've decided to wait until the wallpaper is up to decide. I may end up with a light shade of green.....or even an off white. Of Course, then there is the wood trim. The crown molding and the chair rail have been purchased and shellacked. They have been patiently waiting to be called into active duty. This will be installed after the wallpaper and paint and will probably inspire me to add this tool to my collection. 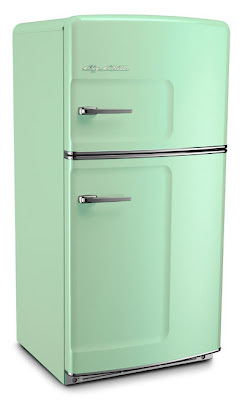 Then, the Tappan Deluxe that is currently gathering dust in my living room will be moved into the kitchen. I have been slowly plugging away on restoring the 1948 stove. A couple of moths ago, I figured out how to install a replacement light socket for the oven. With that task, restoration was pretty much complete. 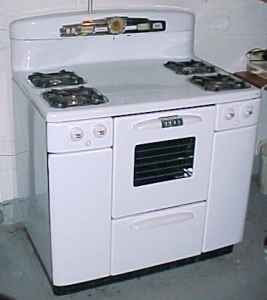 I still have the top & one side off of the stove, so it can be moved more easily. But, it's pretty much ready for the big move. I need to have it calibrated by a pro. But, not everything associated with my kitchen requires dangerous chemicals and weeks of forced labor. Tomorrow, I'm bringing this vintage Tappan Ad, block print and a recipe my grandmother's neighbor gave to me when I was little (I was fascinated by canning) in to be framed. They will hang in the walls. Eventually. With the help of reader suggestions, I was able to locate polished nickle outlet covers.....one for the funky gfi and regular outlet combo over my stove. And my mom and dad wrote a dedication on the bottom of the drawer for my new cabinet. Its fun for me to know its there because they motivated me to get that cabinet designed and built. I think it will also be fun for future owners of this house to discover years from now. Thanks for visiting StuccoHouse (and keeping me motivated on this multi-year kitchen restoration project).